This post is part of an inquiry project my students are working on. We've been looking at our impact on the environment. Students are writing blogs and giving presentations on the area each has chosen to study. This post will serve as a mentor text blog post for my students. Thanks! Two years ago my eyes were opened. A friend shared the video below about plastics in our environment and I began to wake up. 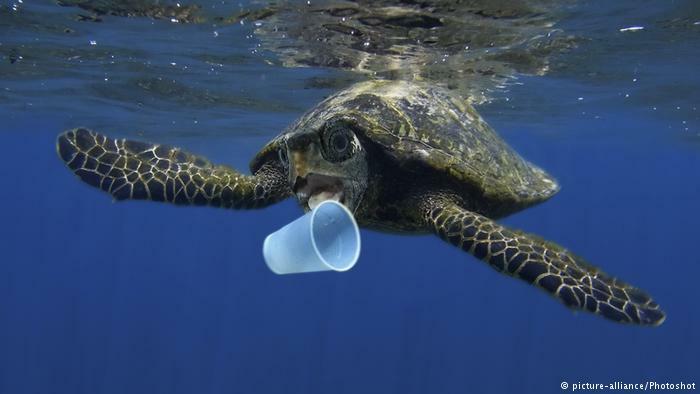 Each year eight metric tons of plastics find their way to our oceans. Those pieces of plastic also make their way into us - through our water supply, the food we eat, and other items in our environment. As you can see in the video below, 93% of Americans have some trace of BPA in their bodies. BPA is a chemical that is used to make plastics. That is terrifying. After watching Jeff's video, and others like it, I began to educate myself on the dangers of single use plastic. Items in this category include plastic grocery bags, which take over twenty years to break down in the ocean or landfills. Humans are purchasing an insane amount of beverages in plastic bottles, over one million bottles per minute, 91% of which are not recycled. This made me reexamine my own life and what my plastic consumption was like. What I have found is that reducing your use of plastic is not easy. Whether it is in eating my normal string cheese, individually wrapped in plastic; grabbing a drink on a road trip; or even cleaning up after your dogs, we use plastic. What is important for all of us is to reduce the amount we use, recycle when we can, and make sure we get our trash where it is supposed to go. The Plastic Pollution Coalition is making strides in this area. Thanks to education from their site and sites like it, I have worked to refuse, reduce, reuse, and recycle. I use travel mugs and water bottles made from aluminum, have purchased biodegradable dog waste bags, and bring my own bags to the grocery store. I know I can do more, we all can, and I pledge to work to do so. What about you? What are you doing to help our planet - in regard to plastic or another issue that is impacting our world? What are you passionate about? Please share. Together I am certain we can make a difference. I tell you what, it has been a rough few weeks for my family. First, my Uncle Bobby passed away. I wrote about that HERE. Then, just over a week ago, my dad's cousin Jim passed. Jim was far too young, only sixty-six, but had been battling some health issues for a few years. I thought of Jim a lot this week while I taught. Jim was quiet, but had a lot to say if you talked to him on the side of a party. He would never be comfortable taking the center stage. Jim loved farming, animals, and helping out. Since he's passed so many friends have shared that they remember him as a good guy, willing to lend a hand. I remember telling a colleague at school years ago that I was related to Jim and she said she knew him, of course. That he always was willing to help out at the Knights of Columbus BBQ each year. I, like many, have my own memories of Jim. 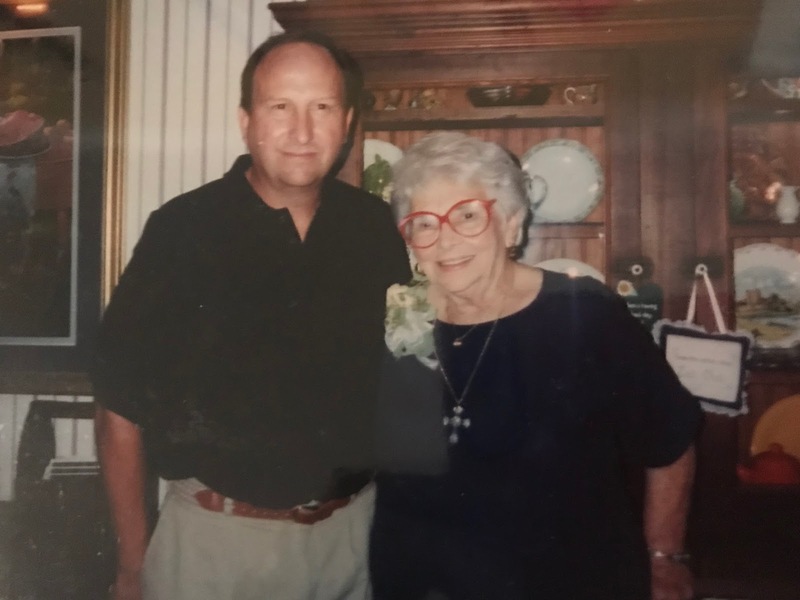 How he helped his mom in her later years without complaint. That he was an insane driver that scared me to death, but he still picked me up when I needed a ride home to the country in a crazy blizzard during my first years of teaching. (I counted my blessings that we didn't end up in a ditch.) And I remember Jim's love of dogs. He had Blackie and Whitey (no idea how he spelled them) as I grew up. When Chris and I moved to my grandma's farm before buying our own house, we got our first dog, Bally. She was an adorable golden retriever pup. I called Jim and his mom, my great aunt GG, once I brought her home. I'm not sure if they took off at a sprint, but they were walking through my backdoor within minutes, just so they could cuddle that dog. And I will always remember the stories of Jim and his dad, who we call Colonel, on the fishing trip. For a variety of reasons, they cannot be repeated here. 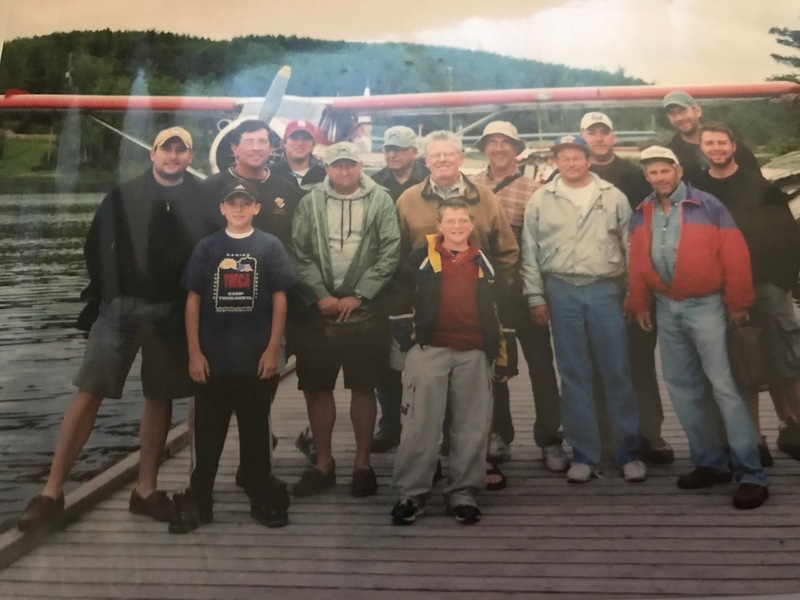 As I sifted through these memories this week, I thought of the lessons Jim had taught me. That not everyone demands the spotlight, but to get to know those quieter people, you need to reach out, to meet them where they are. You are all the richer for having done so, they have a lot to teach us too. So, thanks to Jim, I made sure I did an extra sweep of my classes this week, chatted with all my students, not just the ones begging to speak. There are so many kids like Jim hiding in plain sight. I'm grateful to the reminder to see them too. Godspeed, Jim. The world was richer for you being here and we will sure miss you. I first met Tammy Mulligan and Clare Landrigan several years ago when they wrote the fabulous book, Assessment in Perspective. Over the years I've caught up with them at conferences like All Write, NCTE, and NerdCamp Michigan. Each time I see them I'm struck by how smart they are, and how much they want to help teachers. When they shared they were writing their newest book, It's All About the Books: How to Create Bookrooms and Classroom Libraries that Inspire Readers, I was grateful. I didn't know of another book out there that would be a resource like this for those of us in the classroom. We need something like this book to share with our administrators, to show them the need for book rooms, classroom libraries, to share what they do for our kids. Tammy and Clare have written this book and it will not only help inform our decisions as we create these libraries, but it will also support us in our work. Clare and Tammy's book is set up to help you from the ground up. It begins with research on why books are necessary for developing life long readers. 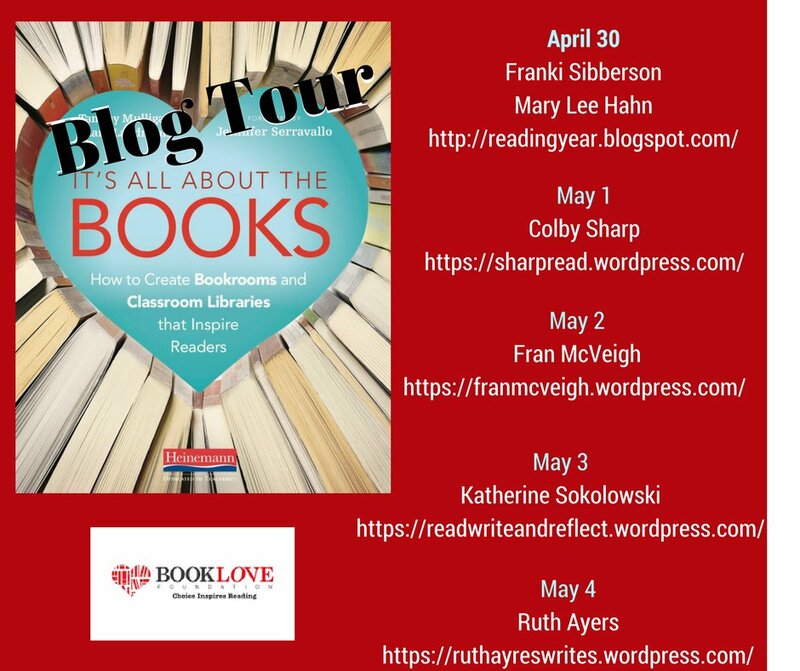 There are chapters on choosing books, organinizing them, the inventory process, how to get the books, supporting your students in their book choice, and more. This book will be beneficial for teachers just starting out and veteran teachers who want to reflect and examine the way they have set up their classroom library. It's All About the Books covers every possible question of setting up classroom libraries and bookrooms. They look at what you can do with a variety of funding levels, how to manage a bookroom, and there are so many visuals throughout the book, you can't help but be inspired. But don't take my word for it, check it out yourself. 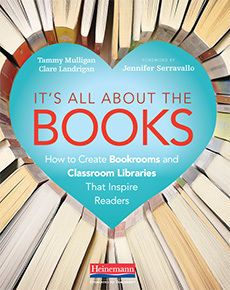 Heinemann has graciously offered to give away a copy of Clare and Tammy's new book to one reader of this blog. If you'd like to enter, please fill out the Google Form below. I will select a winner by 11:00pm on Thursday, May 10th. Good luck!